3 CT. T.W. 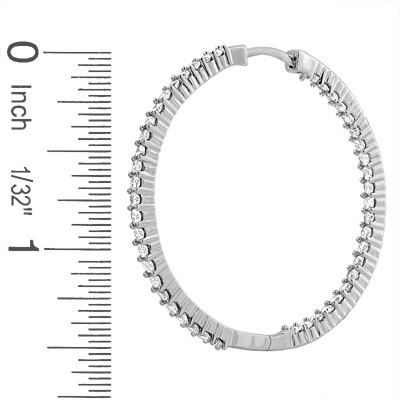 Front and Back Diamond Hoop Earrings in 14K White Gold The woman who wears these earrings will draw attention to herself from all angles--as she crosses the room, even those behind her will turn to watch a woman so confidently bedecked in glittering diamonds. 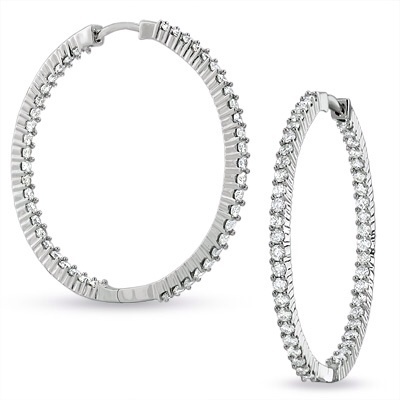 As beautiful from the front as from the back, these 14K white gold hoops feature diamonds totaling 3 cts. Wear your hair up to let these earrings speak for themselves, showing the class and elegance you're known for having. PRODUCT SPECIFICATIONS Stone Type	Diamond Stone Shape	Round Diamond Total Weight (CT. T.W.) 3 Stone Setting	4-Prong Gold Karat	14K Back Type	Friction Lifetime Diamond Commitment	Yes Metal Color	White Metal Type	Gold Stone Color	White Diamond carat weights (CT.) represent the approximate total weight (T.W.) of all diamonds in each setting and may vary no more than .07 below the stated weight. Typographic errors are subject to correction. Merchandise enlarged to show detail and may not always be exactly as pictured. Promotions, prices, styles and availability may vary by store and online.